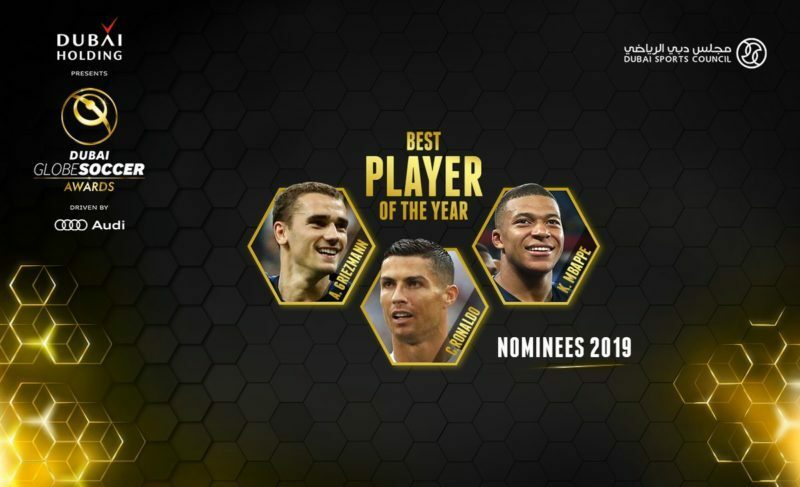 Juventus‘ Cristiano Ronaldo, PSG‘s Kylian Mbappé and Atletico Madrid star Antoine Griezmann have been selected as the three finalists of the Globe Soccer Award for the ‘Best Player of the Year‘. The nominated players will bring home the tenth edition of the Globe Soccer Award on January 3rd in Dubai, UAE, in collaboration with the 13th Dubai International Sports Conference, sorted out by the Dubai Sports Council. Globe Soccer’s CEO, Tommaso Bendoni, declared the three selected players, saying: The tenth anniversary of the Globe Soccer Awards is a special milestone, so we are delighted to present Cristiano Ronaldo, Antoine Griezmann and Kylian Mbappé as the finalists in the Best Player category“. Cristiano Ronaldo has been nominated for the award multiple times already, taking it home on four occasions – including the latest version, in December 2017. In spite of the Portuguese’s history in the competition, the French duo could pull up strings as they have a World Cup trophy up their sleeves. ‘Colchonero’ forward Griezmann also lifted the Europa League and the UEFA Super Cup with Atleti, while Mbappé finished the season-high winning three domestic titles with Paris Saint-Germain. Past winners of the Globe Soccer Award – aside Cristiano Ronaldo – incorporate Radamel Falcao in 2012, Franck Ribery in 2013 and Lionel Messi in 2015. I Am One Of The Best Players In History, I Deserve To Win A Sixth Ballon d’Or !